Comment: What an amzing sister! Mashallah! Behind every successful man there is a woman, they say. Who is behind a successful woman? There are thousands and thousands of women who have taken hurdles head-on and excelled in their life, and are now pride of the family, the society and the nation at large. In the league of such women of inspiration are many Muslim women. TwoCircles.net is presenting a Special Series on Women of Inspiration – Editor. Mumbai: Nation’s Pride and all along a supportive daughter, sister, wife and a caring mother. 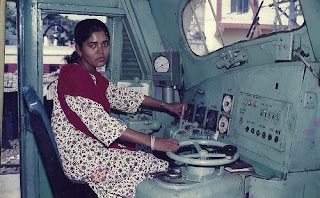 This is Mumtaz Kazi, the first woman diesel engine driver in Asia. Limca Book of Records, in its 1995 edition, has acknowledged her great success. 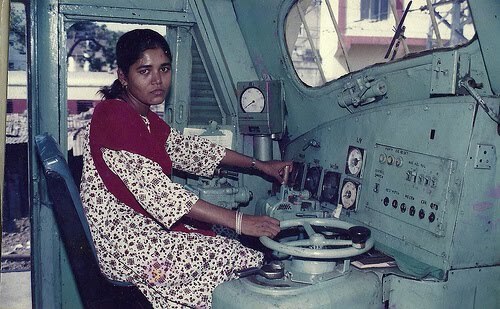 Adding another feather to her cap is that she is the first train driver who has the skill of driving both Electric and Diesel engine. In 1989, the change in the railway recruitment board policy in India enabled her to sit for the exam and she fared very well with the merits in all the exams right from written exams to Personal Interview. With the experience of nearly 20 years she is now serving the most crowded railways in the world the Mumbai Local. Born and brought up in Mumbai, Mumtaz has seen many ups and downs in the life but it’s the family support that kept her moving. Taught in Seth Anandilal Poddar High school, Mumtaz applied for the motorman job after her SSC in 1989. She got appointed in 1991 after the completion of her twelfth exam. But this was resisted by her father. “When I was selected my father, Allahrakhu Ismail Kathawala, who himself was in the Railways as the Trunk Superintendent at Churchgate railway station resisted and ask me to complete my DMLT course,” says Mumtaz in an interaction with TwoCicles.net. But A.I. Kathawala, as her father was popularly known,was advised by his friends in railways and other relatives tried to convince him to allow Mumtaz join the job. “It’s the R.V. Raikar uncle, who was a close friend of my father, finally succeeded and convinced my father,” informs Mumtaz. Mumtaz is not just successful in her profession but a very typical Indian woman. She is helpful, supportive and sacrificing for her family. A.I. Kathawala continued to praise her courageous daughter. He said it’s because of her support he was able to buy a home in Mumbai and was able to educate his two sons Imtiyaz and Feroz, both are engineer and now settled in Canada. Now mother of two beautiful kids Tausif Ahmed, 8 and Fateen, 4, Mumtaz married to Maqsood Kazi, an electrical engineer from Nandoorbar, a district of Maharashtra near Gujarat border in 2002. Mumtaz’s family is originally Gujarat. What does Mumtaz think for her kids? “I am educating and bringing them up to be successful in both the world here and hereafter,” she said.